There are only a couple of hockey themed slot games, which is rather difficult to explain given how popular this sport is in North America. Unfortunately for NHL fans an agreement hasn’t been reached yet between the players and the league, so the season is on temporary lockdown and there is no reason for optimism. Meanwhile they can find all the thrills they seek in Break Away slot, not to mention the chance of winning large prizes while enjoying their favorite game. While they are deprived of the chance of seeing hockey rings, skates, ice makers, referees or masks on TV, all of these are available as symbols. There are exactly 243 winning combinations, and the best paying ones are triggered or enhanced by the Break Away logo which serves the role of a wild symbol. This particular slot game has no less than 40 such symbols, and things get even better when they appear on the fourth and five reel as stacked once. The scatter symbol is the flaming puck, and just like in most Microgaming slot games, at least three of them are required for a payout. When it comes to free spins, the bonus round can award 15 to 25 such spins and multipliers are used to maximize the profits they deliver. No slot game these days is complete without bonus features, and Break Away has two of them that stand out from the crowd. 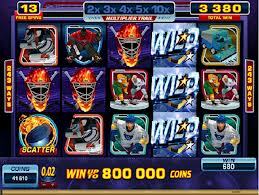 Smashing Wild is the most visually attractive one, because before the payout is awarded, players are also treated with a brief animation depicting two ice hockey players crashing into each other. Less exciting but equally lucrative is the Rolling Reels feature which has the role of increasing the prizes awarded after successive free spins.